What I am about to propose is an idea i've been thinking about since Creatures moved into space! At the moment, there is a 'cluster' of ships in "cyber space" floating around, the only thing connecting them is the warps, be it by chamber or portal. If the ships movement was to also become "interactive" to the user, I think that this would add a new dimention to the game. I'll explain my picture. At the moment, we only (pfft only she says!) have three ways of sending cretures to other users, they are warping through portals, warping through the chamber and exporting and importing. We now with the creation of the Docking Station to be able to link the Creatures game and the Docking Station. What if we were able to Dock our Dockers with each other. Leave the game running, so that the Messo in every ship involved in the link would be able to let norns pass in and out, with out the risk of getting sent a random creature who does a "send to anyone". Now I realise that this idea is very similar to warping, but you would also be able to view the creatures on the other ships like you do your own with an option on the Creature Selector bar, which says which ship your looking at. While you'd have no direct control, you'd still be able to view the norns on the ship and be able to view their records. Another thing that could be introduced would be space Quadrents. These Quadrents could be either user made, or Creature Labs sent out to the more experienced players to control eg Frimlin (although he's a game user and a worker... but Ash is the only user that I can think of at the moment!) I think that they should be Creature Lab made because to many would Create complcations again. 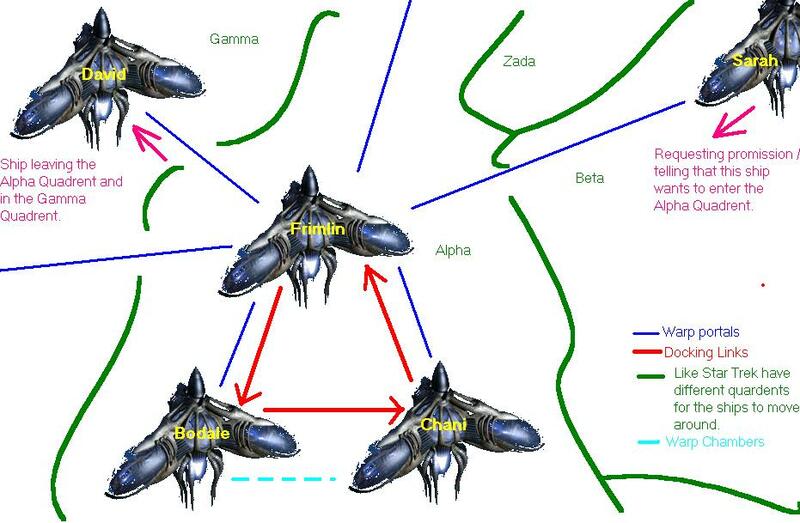 Say in this example that Frimlin is the "mother ship" for the Alpha Quadrent, he would be able to accept or re-direct people from entering the quadrents. This idea I think would be handy for new users, who would benifit from having their own little 'world' to play in until they get used to the game. Frimlin is Docked with Bodale, and Bodale with Chani and Chani with Frimlin. Like the connectable agents, only 1 reciever and sender would be allowed. However both can send and recieve norns and other creatures from each other. Sarah is wanting to come into the Alpha Quadrent and join, which would involve one of the senders in the chain to disconnect from their current ship and then connect with Sarah, while she connects with Frimlin. At the bottom of the screens would be a basic chat screen, or like with 'CAOS' how the text is basic white and over the screen and very bacic, which would allow the users to communicate freely with each other. Sarah: Frimlin, i'm new, can I join? Frimlin: Sure thing, welcome aboard! Chani: If you need any help, just ask. Sarah: Who do i dock with? Chani: I'll de-dock from Frimlin and you can dock with him and i'll dock with you. Frimlin: Sounds like a plan! The small camera's in the world would also be visiable on the comms screen (using another selection screen) as this would also help the new users, esp the younger ones, who've not played the game before to get some instant help. To make the ships move around the 'cyberspace' would make the game a little bit more involved. (as if its not already) . But the ship is just as much a part of the game as the Creauters, it will more then likely make the game play a little slower, but it's an idea to ponder. As well as, or instead of the Dockers docking with each other, having another even smaller ship called Docking Scooter, where only 1 - 2 levels are on the ship. Only the Living Area, a smaller Warping Chamber and the Comms room were avaliable, with a smaller limit of creatures. The Scooter could "scoot" between the worlds/ships with a norn, or a family or norns, until someone was to picks them up and enters them into their world. You could set the Scooter with a limit of 5 and have a "mum" norn and a "dad" norn and their 3 baby/ kid norns all in the Scooter. When a person was to go to the Comms Room in the Docker, and request a Scooter be sent to them (by clicking on a button that would be there) almost like a large warp, but you control when you recieve the norns. The user will be Docked with a Scooter and then all the norns would appear as though they have been imported. On the registration papers, it could either be said that they "Scooted out from" and "Scooted in to" etc, or leave it as warp or export and import.